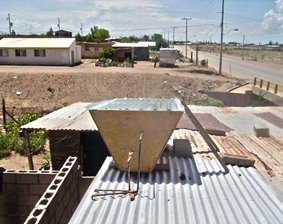 Solar water heaters for the very poor who cannot afford propane proved critical during last winter’s 1 degree low. We use the steel inner tank from used water heaters, place it in an insulated crib, cap it with a plexi-glass lid and forever, hot water without cost, so important for our good folks. The photo shows the simple but effective unit. One unit installed, with materials: only $145. Used but suitable inner tanks are hauled from Utah by Rotarian Ralph Bair. Installation labor is provided by our WoA team. Electricity is unavailable to thousands. Because the high desert skies are sun-drenched and clear, we are promoting individual solar electric generation. 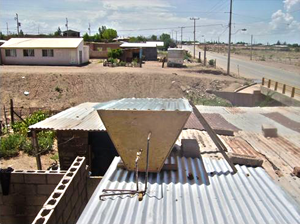 We have installed a prototype on the roof of a special friend, blind musician Esteban, who is employed by the town’s water company. Esteban is very bright and well-educated. He is able to describe to neighbors how the system works. He encourages them to save for the opportunity. If they can save $275 (the cost), we will install the system for them. In the photograph is Fred Berthrong, of Logan, Utah Rotary, a retired Navy nuclear engineer. He bought and installed the first system. 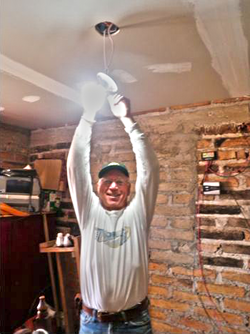 If donations arrive for more electric systems, our team will install them. Mexican highways are narrow and dangerous, but unknown to most travelers is that no emergency support is available, no first responders will appear. 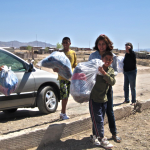 In November 2007, Director of the Technical University Domingo Trujillo, his wife, and three teenaged daughters were driving home from Juarez along the Mexican highway to Agua Prieta. A terrible accident happened. The three girls were badly injured, two dying in the ambulance dispatched to the scene from Agua Prieta. The ambulance was only a van painted as an ambulance without equipment and the Cruz Roja team were not trained. Wings of Angels has responded to this and similar tragedies by partnering with a Douglas fire fighter and Arizona and Utah Rotary clubs to provide first-rate EMT training and ambulances for the region. 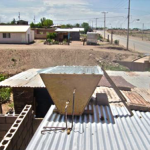 Last year we completed the EMT class in Agua Prieta, Sonora. Sixteen people graduated from this class; they received the same training an EMT would receive in the United States. Thanks to the City of Hyrum, Utah and the Arizona Department of Health Services, we were able to donate two ambulances to the Agua Prieta Cruz Roja volunteers. In addition, through the generosity of Wings of Angels Foundation, we purchased personal medical equipment for each one of these students, which was presented during their graduation ceremony. 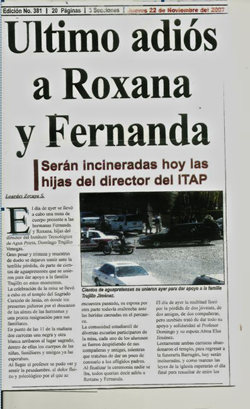 Quite honestly, I had my doubts about how much of an impact we would have on the EMS system in Agua Prieta. I had already trained about 40 EMT’s from all over the state of Sonora, but most of them had left Cruz Roja before passing on their skills and knowledge. 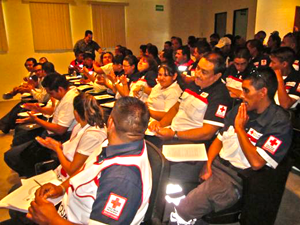 In addition, Cruz Roja would not recognize them as EMT’s, since their system allowed only EMT’S trained in Mexico City to be certified. On July 5th of this year, while off duty, I received a call from Mario Novoa, Douglas Fire Chief. He reported he had received information about an accident in Mexico with multiple patients. The person who called him advised him to expect about 18 critical patients coming into Douglas. Given my relationship with Cruz Roja, he asked if I could help coordinate the transport and care for these patients. I responded to the Douglas Fire Department and started calling Cruz Roja for additional information. I was told the accident involved a head-on collision between two vehicles, with two adult fatalities on scene and approximately 11 children injured, some critically. Fortunately, we learned that only three patients would be coming to Douglas. We dispatched units to the port of entry. After all the children were transported, my DFD coworkers told me that all of those patients were properly immobilized, had IV’s in place, their wounds were properly managed, and shock prevention measures were in place. Happy to report, to the best of my knowledge, all three survived without any permanent damage. We must have taught them something right! On Sunday, August the 2nd, while on duty, I was notified by Cruz Roja of another accident with multiple fatalities and injuries. This time it was a collision between an SUV and a semi trailer. After the collision, both vehicles went off the road, and the trailer landed on top of the SUV. I saw the pictures in the AP newspaper, and they were horrific. They advised they would be bringing two teenagers with critical head injuries to the US. Again, both of these patients (a 14-year-old boy and a 17-year-old girl) were properly immobilized, had IV’s in place, and even better, they had both been intubated. Both were receiving proper oxygenation. And, best of all, all the volunteers were wearing gloves and other personal protection equipment. Something else that surprised me: a female doctor was in the ambulance with the 14-year-old boy. She gave me a very professional and complete report on the patient’s status and treatments he had received. I do not know if these patients survived. One newspaper said the girl died, another said the boy died, and a third newspaper said they both died. I had an opportunity to talk to the Cruz Roja volunteers after the fact, and they told me that since they started implementing advanced trauma procedures, the doctors are more respectful of their work, and are more willing to help them. For the longest time, ambulance volunteers were seen by Mexican doctors as nothing more than patient loaders and transporters. Conflicts between the two sides were frequent, and if any Cruz Roja volunteers attempted any advanced procedures, they were promptly threatened with legal action for “practicing medicine without a license.” I know; I lived through that era. Now doctors are accompanying patients during transport, riding in the ambulance, stopping to render aid at the scene of the accidents, and helping train the volunteers. Later that same day, we were called again to the port of entry. A teenager from Douglas was involved in a rollover in Agua Prieta, and he had critical head injuries. Again, the patient was properly immobilized, treated, intubated, and a different doctor was in the ambulance with him. Unfortunately, his injuries were so severe that they were non survivable, and he died shortly after being transported. As you can see, the training program that you helped put together has not only saved lives. It has helped change old attitudes towards the ambulance volunteers. It has motivated more people to do more things for those who suffer injuries. These changes were long overdue, and although they are happening very slowly, THEY ARE HAPPENING. The ones who will benefit are the patients who find themselves in need of these services. In cooperation with the Douglas Fire Department and Arizona and Utah Rotary Clubs, we are forming Mexico’s first Urgent Care Center to serve the little villages and towns within the remote Sierra Madre, all which have access to the town of Huachinera (founded in 1650) at the epicenter of the region. We have the support of the town mayor, a doctor has signed on and Logan Utah Rotarians have donated an ambulance. Several of the recently trained EMT’s will sign up to serve there. Now in its thirteenth year, continues to provide monthly services for those not cared for by any other agency or group. We are popular throughout the region and receive patients from as far away as seven hours because others have assured them that Wings of Angels will help them. They arrive in great anticipation and we give them support and comfort. 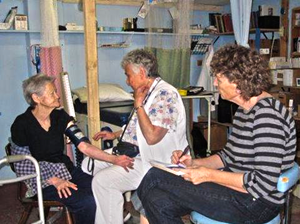 Our Medical Director is an experienced nurse practitioner with previous service in Yemen and the Navajo Reservation. She has seen everything, and fits right in. We are able to provide so many things missing from the culture of the poorest in Mexico because we have a competent, skilled core which has been together for more than ten years. We are able to do this on an annual budget of $35,000. As you know all the US participants are volunteers. Our donors are thrilled to participate. If you are able to support us in any way, not a cent is ever wasted. God bless you, I miss guys.